Paul J. Browne, currently the deputy commissioner of public information for the New York City Police Department, has been appointed by Rev. John I. Jenkins, C.S.C., president of the University of Notre Dame, to the newly elevated post of vice president for public affairs and communications, effective Aug. 19 (Monday). Working closely with the president, Browne will be responsible for developing and implementing a comprehensive communications strategy to enhance both nationally and internationally Notre Dame’s growing reputation for preeminent research, superb graduate education and unsurpassed undergraduate education — all informed by a distinctive Catholic mission. Browne will provide leadership in advancing the University’s interests and contributions in the public arena and direct Notre Dame’s communications toward its multiple internal and external audiences. The University’s public affairs and communications division encompasses the following departments and units: internal communications, marketing communications, multimedia services, print services, Web services, Notre Dame Magazine, public information, public relations, strategic communications planning, public affairs, community relations, community engagement and the Robinson Community Learning Center. Father Jenkins expressed his appreciation to Louis M. Nanni, vice president for University Relations, who assumed oversight of communications and public affairs in addition to his other areas of responsibility during a two-year transitional stage, and Matthew V. Storin, who returned to his alma mater after a long and distinguished career in journalism to direct communications for the past year. 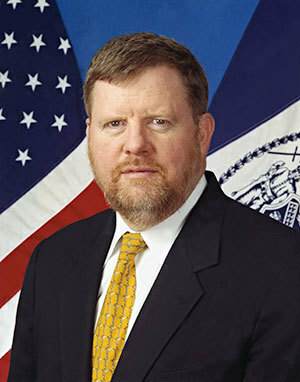 Before becoming chief communications strategist and spokesman for the 50,000-member NYPD, Browne served as press secretary and chief of staff for the late U.S. Sen. Daniel Patrick Moynihan — the University’s 1992 Laetare Medalist — and in similar posts at the U.S. Treasury Department, the New York State Court of Appeals, the New York State Commission on Independent Colleges and Universities, and also as vice president for advancement at his alma mater, Marist College. Browne also served as deputy director of the International Police Monitors in Haiti, with a United Nations mandate to end human rights abuses there and to establish an interim police force during the U.S.-led “Operation Restore Democracy” in 1994-95. For his Haiti service, Browne was awarded the Commander’s Medal for Public Service by then-Chairman of the Joint Chiefs of Staff, U.S. Army Gen. John Shalikashvili. Before entering government service, Browne was a newspaper reporter, first for the Watertown Daily Times in upstate New York and later as Albany bureau chief for the New York Daily News and the New York Law Journal. He also served for many years in New York’s state capital as a stringer for the New York Times. His freelance reporting has been published in the Washington Post and other publications. He is a former member of the board of the American Irish Historical Society and has been published in its journal, The Recorder. A native of the Bronx and a graduate of Mount Saint Michael Academy there, Browne received a bachelor’s degree in American studies from Marist College and master’s degree from the Columbia University Graduate School of Journalism. As an undergraduate, he studied for a year in Bogota, Colombia, and upon graduation served as a lay volunteer teacher at the Marist Brothers High School in Pago Pago, American Samoa. He was married to the former Sarah Purcell at The Abbey in Galway City, Ireland. The Brownes, who will celebrate their 35th wedding anniversary next month, have an adult daughter, Lacey. Originally published by Dennis Brown at news.nd.edu on July 18, 2013.